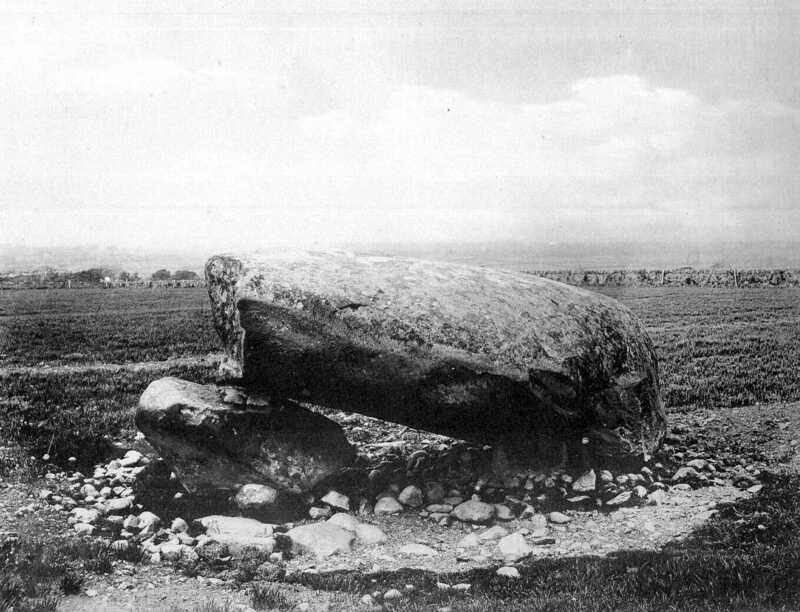 In the parish of Llanfair-is-gaer, on a farm called Bryn, just above Griffith's Crossing Station, are the remains of this Cromlech. It lies in a field on the left hand of the road leading from Crug [Farm] to Port Dinorwic, and is about half a mile from Bryn Farm. The capstone is lying with its east end upon the ground, and the other end rests on the only remaining support left. It is ten feet nine inches long by nine feet at its widest part, and averaging from four feet, at the end that is on the ground, to two feet seven inches at the other end, in thickness. The length of the remaining support that is lying beneath it is five feet five inches, by four feet wide, and two feet thick. This is not recorded in Arch. Camb.